Figure 1: Series of kinetic energy spectra of 4p photoelectrons detached from krypton atoms by a 13.5 nm XUV pulse in the presence of an intense pulsed THz field. The energy shift of the electrons versus the XUV/THz delay directly represents the vector potential of the THz pulse. 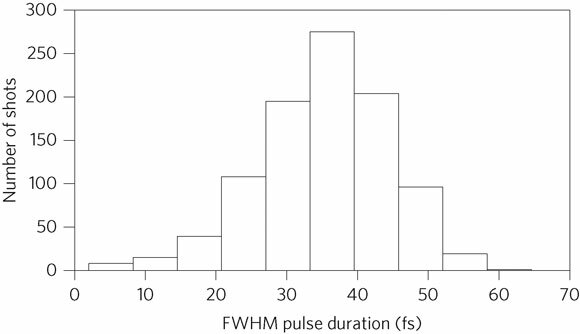 Figure 2: Reconstructed FWHM pulse durations of 1,000 individual 13.5nm pulses from FLASH. The average pulse duration was 35 fs with a standard deviation of 9 fs. 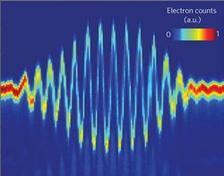 Figure 3: Non-streaked (a) and streaked (b) photoelectron spectra of a single FLASH soft X-ray pulse. Plotted as lines are simulated spectra that best fit the measured ones. The bold line in (c) is the reconstructed temporal structure that best fits the measured spectra. The dashed and dotted lines correspond to the upper and lower limit of the 90% confidence region for the delay. Published as: “Single-shot Terahertz field driven X-ray streak-camera”, Nature Photonics doi: 10.1038/NPHOTON.2009.160. A few-femtosecond X-ray streak camera for the temporal characterisation of ultrashort X-ray pulses produced by a free-electron laser has been realised at FLASH. In the experiment the electric field of an intense THz pulse is used to accelerate photoelectrons which have been ionised by the FEL pulses. Borrowing its concept from attosecond metrology, the femtosecond X-ray streak camera fills the gap between conventional streak cameras with typical resolutions of hundreds of femtoseconds and streaking techniques operating in the sub fs regime. Its single-shot capability permits to determine the duration and time structure of individual X-ray pulses which at SASE FELs fluctuate from shot to shot. Free Electron Lasers (FELs) are unique sources for intense ultra short soft X-ray light pulses with pulse durations of a few femtoseconds. Due to the employed self amplified spontaneous emission (SASE) mode of the FELs the pulse duration and temporal profile of the soft X-ray pulses fluctuate from shot to shot . 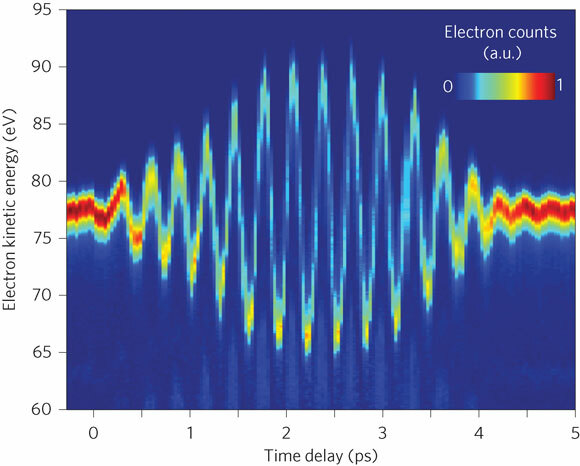 For a single shot measurement of the temporal profile, a new few-femtosecond THz-field driven streak-camera has been realized at the Free Electron Laser in Hamburg (FLASH). In its conventional form using photocathodes and deflector plates the temporal resolution of streak cameras is limited to a few hundred femtoseconds. The limitation is mainly due to a temporal broadening of the electron wavepacket upon propagation from the photocathode to the deflector plates. In our experiment the FLASH soft X-ray pulses are collinearly overlapped with intense THz-pulses from the FLASH THz undulator [2,3] in a krypton gas target. The gas atoms replace the photocathode and are ionized by the XUV pulses. The resulting photoelectrons are immediately accelerated by the electromagnetic field of THz-light pulses. The kinetic energies of the photoelectrons are measured with time of flight spectrometers. The momentum change of the electrons due to the acceleration by the THz field depends on the phase of the field at the time of ionization, thus the temporal profile of the ionizing soft X-ray pulse is mapped onto changes of photoelectron energies. This technique is intensively used in attosecond metrology utilizing a near infrared streaking field [4, 5, 6]. In order to adapt it for the analysis of pulse durations of a few tens of femtoseconds rather than attoseconds, the oscillation period of the streaking field has to be chosen accordingly longer in the THz range. 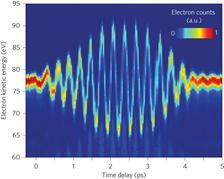 For any reconstruction of the temporal profile of the soft X-ray pulse duration out of measured streaked photoelectron spectra a precise knowledge of the time dependent streaking THz field is essential. It can be sampled by measuring the field induced energy shift of the photoelectrons upon scanning the time delay between the THz and soft X-ray pulses. This energy shift directly represents the vector potential ATHz of the THz pulse . Fig. 1 shows a series of kinetic energy spectra of krypton 4p electrons detached by 13.5 nm FLASH pulses in the presence of 92 μm THz pulses. The delay between both pulses was varied in steps of 33 fs, and each spectrum represents an average over 25 shots. A band pass filter was used to narrow and smoothen the THz spectrum. If the delay between the soft X-ray and THz pulses is set close to a zero transition of the THz vector potential a small timing jitter between both pulses translates into energy fluctuations of the streaked photoelectrons. By analyzing the fluctuation of the mean energy of single shot photoelectron spectra, an rms jitter of 5 fs was determined. was determined. Under the assumption of a Gaussian pulse shape and a constant linear chirp the pulse durations of the individual XUV pulses were reconstructed (Fig. 2). The average pulse duration was 35 fs FWHM with a standard deviation of 9 fs. A small percentage of the pulses have a pulse duration of less than 7 fs FWHM. Since the employed gas target does not dissipate the X-ray beam, it will become possible to measure the X-ray pulse duration simultaneously to other time-resolved experiments. Sorting the measured data according to the X-ray pulse duration should therefore significantly increase the temporal resolution of X-ray -pump / X-ray -probe experiments. For a fast reconstruction of the pulse duration of many shots a Gaussian pulse shape was assumed. In addition, for some pulses it is possible not only to reconstruct the pulse duration or envelope of the pulse but also a temporal sub-structure consisting of separated spikes. Fig. 3 shows an example of a streak spectrum with two clearly resolved peaks (b) and the corresponding non-streaked photoelectron spectrum (a). To reconstruct the temporal structure of the soft X-ray pulse two Gaussian subpulses were assumed and the corresponding streaked and non-streaked spectra were calculated. The central energies, amplitudes, widths and the temporal separation of the sub-pulses were optimized to fit the measured spectra (the optimized spectra are plotted as lines in fig. 3). The corresponding temporal structure is plotted as a bold line in fig. 3c. The dashed and dotted curves show temporal structures corresponding to the upper and lower limits of the 90% confidence region of the temporal separation of the pulses. In summary we have shown, that a single shot analysis of the temporal pulse profile is feasible for the intense soft X-rays from FLASH with a resolution of less than ten fs. Besides that, it was for the first time possible to measure the linear chirp of the FLASH pulses. We finally underline, that the applicability of the THz-Streak-camera is not restricted to soft X-ray as delivered from FLASH. Since the principle does not rely on any resonant states and higher electron energies will enhance the streaking, it will also become a valuable tool for the upcoming generation of hard X-ray FEL. W. Ackermann et al., Nature Photon. 1, 336-342 (2007). B. Faatz et al., NIM A 475, 363-367 (2001). M. Gensch et al., Infrared Phys. Techn. 51, 423-4235 (2008). J. Itatani et al., Phys. Rev. Lett. 88, 173903 (2002).